So, yesterday, I did a very long post on the ingredients of sunscreen. So, the reason I did that post was because I wanted to do this following post in which that knowledge would be helpful. By the way, I do not claim whatever I had written yesterday is complete. Now, what are the important factors in deciding sunscreen? SPF : Yes. But, as I mentioned in this post, anything above 30 doesn’t really provide extra protection so spf 30 products are enough. And, still, if you want to aim for high, anything beyond 50 is worthless. Labeling : Always buy a ‘broad-spectrum’ sunscreen. The label should be there on the product. Btw, most of the Indian products do not have such labeling conformations which is pretty sad. Ingredients : You would want to ensure you are getting adequate protection so look for the ingredients I mentioned in the chart. Manufacturing : Buy as latest sunscreen as possible because the composition of the sunscreen may break down if kept unused for long. Brand : Always get a trusted and established brand which has proper research facilities. I would definitely add here that do not get herbal sunscreens as they do not have any of the sunscreen ingredients. They might prevent tanning but there is no saying as to they can protect skin from UV radiations. And, I would definitely put my trust in chemical products than sticking to herbal in such cases. Anything I might have forgotten which you think should be included in this list? 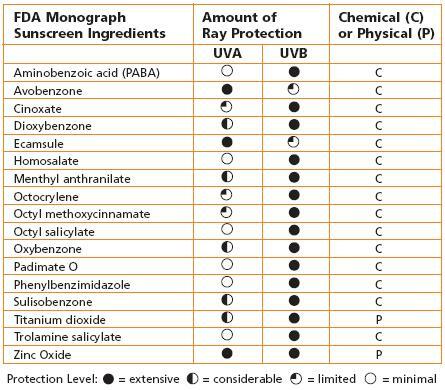 As for the ingredients, we should also look for ingredients that are not recommended to be in sun protection products. For example, quite a bit of sunscreen products contain Vit A or in most natural alternatives, Retinyl Palmitate–for anti-aging. But Vit A degrades under sunlight and Retinyl Palmitate, in particular, is even suspected to make one more prone to skin cancer tumors. Hi swati.wow..you covered pretty much everything….I am making you my “Sunscreen-Guru” …. 😀 bye-the-way,do you think the texture of the sunscreen alter its performence?for example are gel sunscreens better then the lotion ones,etc.? Swati, whatz your reco on the sunscreen then?? Neutrogena is full of chemicals…MVO is pricey unless i get is as a gift..
@Vivi yeah you are right…I shall put up a post regarding his too coz some ingredients make the skin photo-sensitive too!!! @Monali thanks 🙂 I was already doing this post when you asked me your doubts so tweaked it a bit to cover everything I could!!! @Dhanu…I think zinc oxide based sunscreens should be hunted for in the market…yeah MVO is too pricy but I am pretty sure its working way better than Neutrogena too!!! but, availability and expense are main factors so I would say Neutrogena is as good for now for those who can’t afford MVO!!! Thanks for your reply swati!!!! hmmm do you know…i have been to H & G centre so many times in a mind to pick Neutrogena but picked something else just coz of the reason its pool of chemicals and it might harm my skin. Am still unable to decide on the sunscreen..which is sad.My fabindia’s sunscreen is getting over in a day or two!!! hey Dhanu…Fab India does use chemicals too and the same ones as Neutrogena…just think which one would you weigh better – a product which has ingredients but those ingredients wear out as soon as you go into the sun or a product which will hold on….have you read my previous post to this?? I have explained in that why Neutrogena is better than other products…do check that out…that might help you!!! Thanks again Swati,..which post is that…pls give me the link…i wl brave up my heart to pick Neutrogena. I was just wondering…my mom did not use sunscreen throughout her lifetime…yet she does not have any wrinkles…dark / uneven spots…isnt it great!! Hi swati.Even my mom never use any sunscreen till yet her skin is good.I guess our moms didn’t need sunscreens,because at their time they didn’t have to face so much pollution,green house effect,thinning of ozone layers etc etc….and most of all they were eating good natural things not like today’s fast-foods and tempered-products….